The Texas Criminal Justice Coalition advances solutions to build healthy, safe communities across Texas. Access to meaningful data is critical to informing the development of policies that will improve public safety and restore community trust in law enforcement. We’re thrilled to share this incredible resource with those who want to learn more about the criminal justice system in Harris County. Every day, Harris County Criminal Courts process hundreds of cases. This includes all kinds of charges, from trespassing to murder. Everything flows through the Harris County Jail, which is one the largest in the nation and houses upwards of 9,000 inmates. The entire criminal justice operation costs hundreds of millions of tax dollars every year. Throughout the process, they collect a lot of data. For this project, we looked at criminal court data. These data include details about the offenders, their crimes, and their adjudication outcomes. We processed over 800,000 records dating back to 2010. The Harris County Clerk makes this dataset publicly accessible, but they serve it up in one huge file, available only through FTP. Even if you’re able to download the whole file in one sitting, Microsoft Excel has no hope here. It will probably crash before you even get to see the first row of data. TCJCDashboard.com visualizes over 800,000 Harris County criminal court cases back to 2010. One of the goals in this project was to make the data easy to understand and accessible for everyone. To do this, we had to define who the users are and what that means to them. Advocates and academics who specialize in a particular area of the criminal justice system. Donors and funders who can get a better idea of the problem and need. Policy makers who can better understand their impact on the system. Journalists who can use this data to better explore a story. The general public who can approach a complicated topic with self-directed learning. Our hunch was that this information would be valuable, if only the data were easier to analyze. 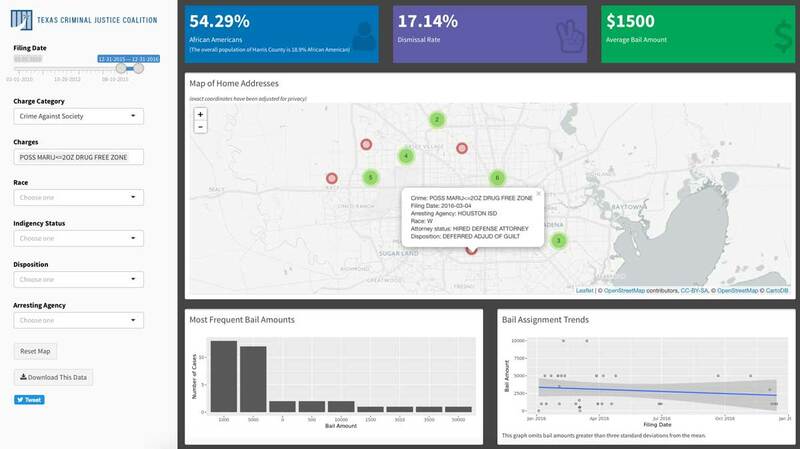 If this project is successful, it will empower these users with more data-driven arguments in the conversation about criminal justice reform in Houston and Harris County. As soon as you begin filtering data, the dashboard calculates key metrics at a glance. TCJC was interested in seeing the African American distribution, as well as overall dismissal rates, average bail amounts, and the average age at time of filing. These metrics are recalculated depending on your filters. Metrics are automatically calculated and provide a summary at a glance. This visualization also includes geospatial integration. Because home address information is something to protect, I used jitter to alter the latitude and longitude slightly. This keeps the marker near the actual address, but not centered on it. The map automatically assigns points into clusters for easy analysis. The dashboard generates a map based on filters such as charge, race, disposition, and date. For researchers and data nerds, all of the data that you slice and dice is accessible in a CSV export. Each record includes a case number that ties the data back to the larger court dataset. You can open the CSV file in Microsoft Excel or a text editor of your choice. What’s Next for this Dashboard? The next version is already in the works, and we’re looking for feedback. There are some obvious bugs and areas for polish. Reporting them is always helpful. But we’re really interested in knowing how you want to use the dashboard. What questions are you asking? How can this dashboard help you answer them? Let us know.